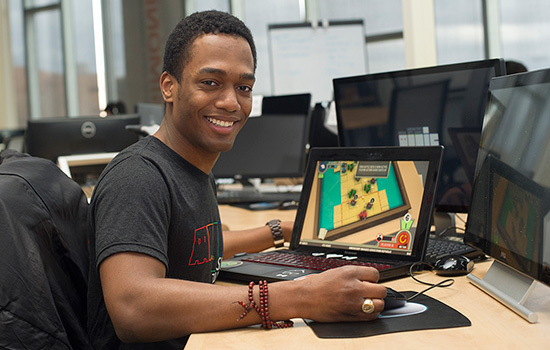 John Miller, a third-year game design and development student from St. Louis, hopes to one day run his own game development company. From the age of 12, John Miller knew that he wanted to design video games. In fact, he set a goal for himself to become a professional game developer by the time he turned 13. Although he missed that self-imposed deadline, Miller, a third-year game design and development student from St. Louis, persisted and this week at the 2017 Game Developers Conference in San Francisco, he will debut Gibraltar in front of students and faculty from the nation’s top gaming schools at the highly anticipated Intel University Games Showcase. Miller began developing Gibraltar during his senior year in high school after years of drawing characters and worlds on paper and teaching himself basic programming and game design using books given to him by his parents. On Thursday, March 2, all eyes will be on Miller and Gibraltar—a fast-paced, territory-focused, turn-based tactics game—RIT’s sole representative at the showcase. Over the summer, Miller was accepted into the Co-Up program at RIT’s Center for Media, Arts, Games, Interaction and Creativity (MAGIC), which in partnership with the Simone Center for Student Innovation and Entrepreneurship, offers students the opportunity to earn cooperative education experience and a stipend, work alongside faculty and staff mentors, and gain valuable business advice—all while developing digital products fit for the marketplace. The 10-week program is made possible through financial support from members of the RIT Board of Trustees. 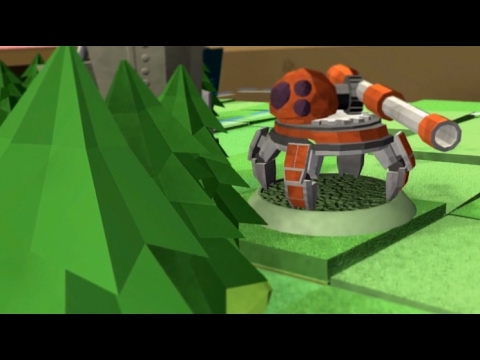 The program allowed Miller to refine the user interface for the game, which he says helped Gibraltar seem more like a commercial product than a student project. Steven Maier, a lecturer in the B. Thomas Golisano College of Computing and Information Sciences, is one of Miller’s mentors and encouraged him to submit Gibraltar to Microsoft’s annual Imagine Cup student competition in 2016. The game was recognized as a national finalist in that competition. Jennifer Hinton, chief communications officer at RIT’s MAGIC Spell Studios, helps identify the best and brightest students to represent the university at GDC and is excited that Miller is part of the traveling team. This is Miller’s first time at GDC, and while he plans to thoroughly savor every moment of the high-octane environment, he realizes the invaluable opportunities lay in front of him. His goal is to one day run his own game development company and the connections he hopes to make with industry professionals at GDC may open doors for him.